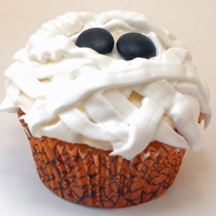 I had more fun experimenting with the Betty Crocker aerosol cupcake frosting and ended up with a creepy mummy. The trick is learning to control the flow of the frosting, and I can’t really say I’ve mastered it yet. How to Make It: Frost cupcake with regular white frosting. Place 2 M&Ms for eyes. “Draw” white icing ribbons (mummy wrappers), overlapping, several times until cupcake is covered except for the eyes.